If you’re a fan of horror, chances are you’ve heard of Hannibal Lecter. The character, a cannibalistic serial killer created by author Thomas Harris for the novel Red Dragon, was instantly popular, going on to feature in three additional novels by Harris and ultimately several films, the most famous of which being the Best Picture winner The Silence of the Lambs (1991). The success of the movies was, ultimately, what led Bryan Fuller, of Pushing Daisies fame, to develop a Hannibal TV series for NBC, which took full form in 2013. The show, which explores the psychosexual relationship between FBI Agent Will Graham (Hugh Dancy) and the psychiatrist psychopath Hannibal (Mads Mikkelson), is perhaps the most bizarre, grotesque and artsy show of the 21st Century – and one that you should seek out right now. The core of the show’s magic comes from its gorgeous aesthetics. Fuller and his team make murder into a canvas, with beautifully-disturbing crime scenes ranging from a human-horse-bird Russian Doll, to a man with a cello shoved down his throat (complete with playable vocal chords! ), to a human totem pole. You would struggle to find more revolting creativity anywhere on television, but the show’s depiction of violence never feels oversaturated. In fact, scenes of actual struggle are so rare that when we do actually see our leads come to blows, in Season 2’s magnificent finale ‘Mizumono’, it’s an absolute highlight, blending tension, gore and emotion in a haunting kaleidoscope of murder. Hannibal isn’t for the faint of heart. But, whilst its gory deaths are akin to something out of the Saw film series, the writing is of such high calibre that it scarcely matters. The cast are nearly-infallible in their performances. Mikkelson is disturbing and charming, terrifying and seductive. To me, he is the definitive Hannibal Lecter, capturing the character’s twisted connoisseurship as well as his capacity for extreme violence. He is matched perfectly by Hugh Dancy as his rival (and implied object of sexual desire), who struggles with his own demons throughout the series, as his mental state unravels, and his connection with Hannibal’s crimes grow deeper. Whilst the show is undoubtedly focused on this central pairing, there are plenty of great supporting characters to spice up the broth. Laurence Fishburne plays FBI boss Jack Crawford, who struggles with letting go of his terminally ill wife Bella in a heartbreaking story arc throughout the three seasons. Caroline Dharvernas is brilliant in the role of psychology professor Alana Bloom, a genderswapped Alan Bloom from the novels, although she is better served when she is pitted against Hannibal rather than rounding out the frustrating love triangle of Season 2 with Hannibal and Will. Gillian Anderson is a captivating, if unfinished, character, as Hannibal’s personal psychiatrist (and implied protege) Bedelia. Certain praise should also go out to some of the show’s recurring villains, who comprise the narrative for much of the first two seasons. Michael Pitt is perfect as the vile aristocrat Mason Verger, capable of inflicting some of the most horrifying torture imaginable on his sister Margo. His fate, being compelled via hypnosis to slice off his face and feed it to a pack of dogs, and finally being suffocated to death with his own pet eel, is appropriately grim, but never gratuitous, fulfilling a devilishly-brilliant character arc. Season 3, whilst incorporating a thrilling manhunt in Venice, also found time to explore the chilling Francis Dolarhyde (Richard Armitage), a brutal beast of a man who becomes an antagonist for both Will and Hannibal. However, the show is at it’s absolute peak when Hannibal and Will are caught in conflict, desperate to outwit one another in a game of chess that rarely lets up in intensity. By the time you are gifted scenes of Hannibal in the iconic muzzle behind bars, it feels right, and earned. The show rarely plays to fan expectations, but it’s a testament to Fuller’s writing prowess that he can so brilliantly combine experimental storytelling with faithful adaptation. Sadly, just as Hannibal promised to set up a brilliant new character dynamic (and potentially bring in Silence of the Lambs characters) for a fourth season, the axe came down on the show in 2015. Talks of a revival, perhaps on one of the online streaming networks, have been rife ever since, although it seems unlikely to happen anytime soon. Regardless, as the end credits play on Season 3’s ‘Wrath of the Lamb’, the story feels satisfyingly-complete, satiating the hunger of the ‘Fannibals’ and casual viewers alike. 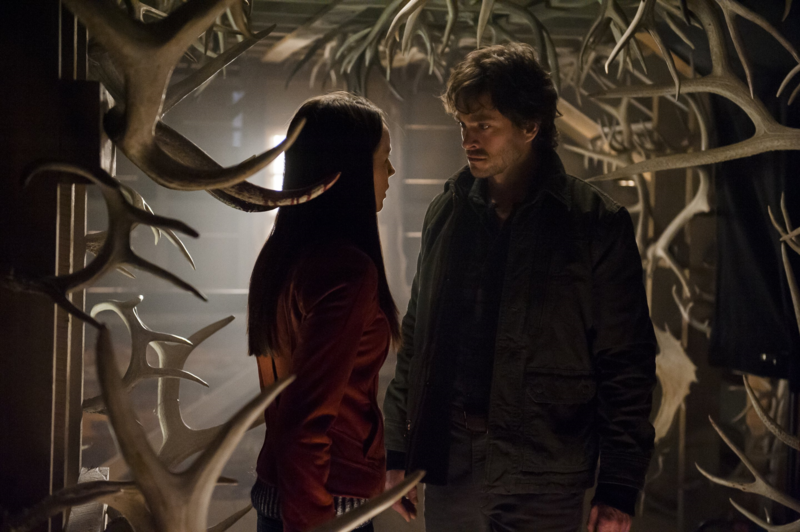 Arguably, Hannibal was the strangest and bravest show on television since the original Twin Peaks. If it’s not something you’ve tried as of now, you owe it to yourself to have a taste. All three seasons of Hannibal are available to stream on Amazon Prime.